DIY PROJECTS GET TO KNOW AMAZING LIFESTYLE BLOGGERS! When it comes to decorating for the holidays, the best advice we’ve heard so far is to PICK YOUR PALLETTE, stick with it and DON’T STRESS! After all, this should be fun and a reflection of your holiday spirit. Here, we’ve picked out a few of our favorite themes for this year! Metallics will never be out of style when it comes to holiday decorating, but gold specifically, screams luxe Christmas! Copper Tones This holiday vignette idea is perfect for the minimalists out there! Clean and contemporary, with just enough subtle accents to reflect the season without going overboard. The Nordic interior style is making waves in North America at last! And for good reason. You can go â&#x20AC;&#x153;full Scandiâ&#x20AC;? as seen here or easily mesh components of this neutral, clean style with contemporary, rustic, vintage, American farmhouse and even industrial spaces! One of a kind gift Do you remember every gift youâ&#x20AC;&#x2122;ve ever gotten and who gave it to you? Hard, isnâ&#x20AC;&#x2122;t it? When you give a holiday Jibe Print to someone, you know they will take it out every year to display in their home and will always remember you got it for them! our cover print with promo code PEACELOVEJOY *Cannot be combined with any other offer. Expires Dec 31, 2016. Have fun! Fun and easy project for an instant boost of merriness! Gift Giving There is only one type of gift that says: "I was made just for you." - A PERSONALIZED GIFT! 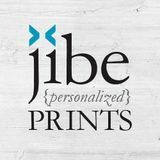 Find one below for everyone on your list or visit jibeprints.com and choose from over 150 personalized prints! The Gift Of Choice! with a Jibe Prints GIFT CARD. Visit jibeprints.com for the entire collection! A picture is worth a thousand words. In this case you only need three. Our bestselling Family Is Everything personalized print looks great as a stand-alone wall art and also makes a great centerpiece in a gallery wall. Get the art that resonates with your family values! 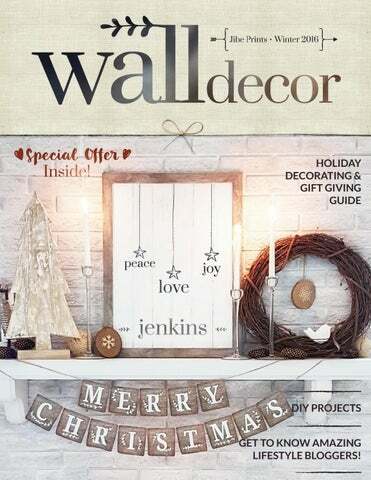 you’re like us… and you love home decorating year round and for the seasons, there is a wonderful community of very gifted super-talent out there waiting for you to discover them! We’ve had a privilege of meeting some of them and their impeccable individual styles and would love for you to meet them as well. On these pages we’ve posted some of their images along with links to their blogs and Instagram feeds. So grab a cup of something tasty, visit their blogs and prepare your eyes and minds for a feast of home decorating, makeovers, and ideas! You wonâ&#x20AC;&#x2122;t believe what this space looked like before! Charmed by the cottage feel - this loft is refreshing and inviting! Exterior walls need love too! This blogger knows exactly what sheâ&#x20AC;&#x2122;s doing inside and outside! Completely custom print! Yes! We do that! The darkest shades in sight, yet this boho detail blends in so nicely with the room and doesnâ&#x20AC;&#x2122;t overpower it due to its light and organic look! Gorgeous natural tablescape and neutral dining room - see more on the blog! Want to try an out-of-the-box idea? Go with teal as the accent colour for a fall tablescape. Stunning! The only yellow in the room - these flowers are a very deliberate and very eďŹ&#x20AC;ective pop of color! Charmed by the farmhouse feel in this dining room! Itâ&#x20AC;&#x2122;s a den makeover and itâ&#x20AC;&#x2122;s fabulous! Love the farmhouse look combined with a touch of industrial due to that amazing shelving unit! Dreamy and romantic, a perfect little girlâ&#x20AC;&#x2122;s room! Next time youâ&#x20AC;&#x2122;re re-decorating, try creating a design board! It will help you stay on track with your design and budget! Versatile and thoughtful from all angles. This print can be displayed year round, the white frame balances out other whites in the room, and it is in a perfect viewing range! Win! Win! Win! paint has already been applied to this 1. White $3 picture from a thrift store. Ready for grey! the paint dry, itâ&#x20AC;&#x2122;s time to dismantle the frame. 2. With The removed backing and picture helped with positioning our yoga print within the frame. two-tone frame. We think it looks great 3. Finished in this serene yoga corner. The sun is out, ready for salutations! Sign up to our mailing list and receive a promo code for 20% OFF your first order!